Mastering the fine art of photographing women underwater takes practice and the application of advanced photography techniques. While challenging, this particular photography genre yields big payoffs, especially when you find the right market for your images. Underwater shots of women run the gamut from strikingly beautiful to edgy, dynamic and powerful. The former is found in unorthodox fashion photography when a model dons a gown and is snapped underwater as though she is floating effortlessly in a liquid wonderland. The ad campaign is a unique blend of underwater, fashion and female photography. Likewise, sports photography and underwater photography team up when women are photographed in pools swimming for Olympic gold or in the ocean going for a triathlon title. Capturing the intensity of a female swimmer cutting through the water is highly desirable to magazine and newspaper editors, who often pay top dollar for vivid underwater shots of athletic women breaking records. The first step in pursuing any career in photography, especially underwater photography is to make sure you have the proper equipment. You need a durable, high-quality, waterproof digital camera that allows you to shoot at a close range. If you only feel comfortable using your traditional DSLR, you may opt to purchase an underwater housing unit. Most units come with special wide-angle lenses and can be supplemented with a separate flash or strobe. For beginners, it’s a good idea to start off by taking underwater photos of women with inexpensive, waterproof digital cameras. Most disposable underwater cameras sell for less than $20 and can be tossed after a single photo shoot. Finally, you might consider investing in a weight belt to maintain the correct buoyancy. You don’t want to be constantly rising to the top of the water when your subject is down below. Snapping stunning underwater pictures of women requires you to focus on your subject and what she's doing. The last thing you want to do is be worrying about your own water safety.You should not be wielding a camera underwater if you don’t know how to swim or aren't a very good swimmer. Even if you are a decent swimmer you might want to take a snorkeling class, especially if you pursue a career in underwater photography. Water reduces color, clarity and contrast by a considerable amount. Consequently, you need to be within two feet of your subject before snapping shots. 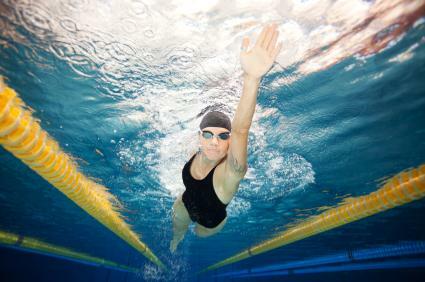 If you are taking pictures of a female swimmer and you can’t move from your designated spot, then consider attaching a wide-angle lens onto your camera housing so you can capture her entire body without compromising the integrity of your shot. Your female subject doesn’t have to be placed in the center of the viewfinder in every shot. You will need to modify the rule of thirds in order to work within your liquid environment. If you are shooting in the ocean and see a school of colorful fish, place your female subject to the side so you can work the fish into the same shot. The female body looks spectacular when shot underwater in silhouette. However, if you are taking a photo of a woman dressed in a specific swimsuit or other garment, which needs to be shown off, it’s best to shoot upwards towards the surface of the water. This position allows you to frame your female subject against the sky’s plain blue background or isolate her with the sun streaming down from the surface to create an abstract underwater photo. When it comes to photographing women underwater let your creative juices flow. Think about unique color combinations and unusual angles. In addition, don’t be afraid to experiment with different lenses. Macro and fish-eye lenses allow you to capture different perspectives underwater. And finally, don’t be shy about using photo editing software to enhance your underwater shots. If you can’t get everything right under the sea, then you can get it right once back on surface by tinkering with the image on your computer.